Huffington Post article and video of the man himself. Physics, it turns out, can get in the way of a good story. After all, the earth is round, which can make horizontal contrails look vertical on the horizon. For an explanation of what actually appears to have happened, see here. This so-called “missile” was likely a flight from Honolulu to Phoenix, or a UPS cargo flight. I notice one innocuous word, likely. As in we don’t know still what the hell it was. But wait, we now have official word from the Pentagon, hot off the presses. Lets go there now and finally get the clarification we need on what it was, and to be able to act smug and laugh at the conspiracy idiots. 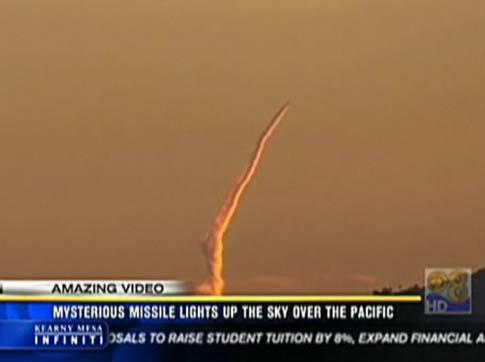 UPI: Military: California contrail not missile. The statement does not say whether the plume came from a military, commercial, government or private aircraft. Having a conspiracy addled brain, I am seeing here a non denial denial. Of course there is no evidence (physical) other than the video, which can, indeed, be a contrail of a plane (or a missile). After all, we did not get clarification on what the hell it was from the Pentagon. But don’t fret, there was no threat, from most probably a plane – nothing to see here, go away already. The Pentagon has spoken, TV has lampooned it, move along, move along. The Telegraph, UK: Mystery ‘missile’ launch in US: the theories. Doug Richardson, the editor of Jane’s Missiles and Rockets, said it might have been a Standard interceptor, the anti-missile weapon which is fitted to the US Navy’s Aegis guided-missile cruisers as part of the American missile defence programme. Doug Richardson, the editor of Jane’s Missiles and Rockets. Robert Ellsworth, the former US Deputy Secretary of Defence, said it was “pretty big” but “not a Tomahawk” cruise missile. Robert Ellsworth, the former US Deputy Secretary of Defence. A more down-to-earth – and non-military – explanation was given by John Pike, director of the US-based security analyst firm globalsecurity.org. John Pike, director of the US-based security analyst firm globalsecurity.org. Let me jump in and state that modern missiles, such as tomahawk (and many others) of course CAN change course, depending on their programming. And the tomahawk is a really old technology. The Pentagon and NASA experts have determined that a billowing contrail seen streaking into the skies above Southern California was likely caused by an airliner and not a missile. Defence Department spokesman Col. Dave Lapan said Wednesday that officials were satisfied it was an airplane contrail distorted by camera angle, winds and other environmental factors including a setting sun. Military experts studied the video and talked to all government agencies that might have been involved in a missile launch and none reported having launched one, Lapan said. The conclusion was independently supported by Al Bowers, associate director of research at NASA’s Dryden Flight Research Center in the Mojave Desert, and Patrick Minnis, a senior research scientist at NASA’s Langley Research Center in Virginia, who studies remote sensing of the atmosphere and Earth’s surface. “A missile would look like that,” said Bowers, whose 27-year career has included stints as chief or lead engineer on such programs as the SR-71 spyplanes turned over to NASA by the Air Force. A missile would look like that… indeed. But it was not moving like a 1950’s missile, it was making corrections to its flight. Like, for example (pure speculation on my part) a Tomahawk missile, or an anti-missile missile defense guided missile. Again, despite hundreds of satellites in the sky, despite NASA monitoring, despite NORAD monitoring, despite air traffic controllers monitoring, we still do not know what it was. If it was an airplane, kindly tell us what flight it was – civilian or military. If civilian, please list the type, the flight number, the destination and its origination. Otherwise, Jon Stewart, Time bloggers, Pentagon officials, NASA officials, americangoy are all just speculating. A complete coincidence over this quote unquote missile launch (of course it’s a plane, just look at the picture, it’s so painfully obvious!) is that there happens to be a nearby American military complex. globalsecurity.org (yes, John Pike’s site, quoted in this article). The Naval Air Weapons Station, Point Mugu, operates and maintains station facilities and provides support services for Naval Air Warfare Center, Weapons Division and assigned tenants and activities. Point Mugu is part of the Naval Air Warfare Center Weapons Division (NAWCWPNS), the Navy’s full spectrum research, development, test evaluation, and in-service engineering center for weapons systems associated with air warfare (except for anti-submarine warfare systems), missiles and missile subsystems, aircraft weapons integration and assigned airborne electronic warfare systems. NAWCWPNS also maintains and operates the air, land, and sea Naval Western Test Range Complex (NWTRC). Readers of UNCOVERAGE.net in the “national defense arena (shall we say? )” say the U.S.S. Ronald Reagan, a Nimitz-class nuclear-powered carrier, is involved in exercises off San Diego, California right now. A caller to the Rush Limbaugh show Wednesday morning said that he believes it was a missile launch that was likely made from the high-security “Point Mugu” Naval Base off the coast of California. Elaine Grossman at Global Security Newswire confirms the obscure San Nicolas Island, which is part of the Naval Base Ventura County (NBVC) Point Mugu facility, is used for clandestine testing of missiles from other countries. Of course, when you accept the government version, you must also accept the fact that the authorities have no idea what flies where over our heads in our national airspace, that NORAD, NASA, air traffic controllers, satellites, anti missile radars searching the skies for Russian, Chinese, Iranian, terrorist missiles and planes do not track objects in the sky nor do they keep records of those objects (civilian planes, missiles, military jets, etc). Isn’t it obvious it is just a plane? If you question this official narrative, that would make you a conspiracy theorist – one of those nutters lampooned in the news media. I mean look at the picture. Founding editor of The American Conservative, Scott McConnell, has just published an in-depth analysis of the origins of the Tea Party’s foreign policy and how the Tea Party may influence foreign policy in the new Congress. McConnell, in an article for Right Web, traces the Tea Party’s foreign policy pronouncements back to Sarah Palin and her close relationship with neoconservative heavyweight Bill Kristol. Kristol, as described by Jane Mayer in The New Yorker, “discovered” Palin the summer before John McCain put her on the Republican national ticket. McCain enlisted influential neoconservative Randy Scheunemann as a policy advisor, and in turn Scheunemann brought on Steve Biegun as her chief foreign policy staffer. Palin’s previous foreign policy pronouncements had been vague and scattered, but she became an eager student. She made hawkish noises during the campaign: while she spoke more loosely than expected about the possibility of war with Russia, she forthrightly supported an Israeli strike on Iran. Despite efforts by paleo-conservatives to reach out to her and provide some counter-influence, she stayed on message—which would have considerable significance as she became a political star in her own right. Palin has continued to hit neoconservative talking points even while the Tea Party movement has, at times, called for cuts in government spending and rejected the Bush administration’s military adventurism. She reliably echoes neoconservative talking points about war with Iran. When addressing the Tea Party Convention in Nashville last February, she hit neocon talking points by citing Ronald Reagan, “peace through strength,” and “tough action” against Iran. Wearing an Israeli flag pin, she charged that President Obama was causing “Israel, our critical ally” to question our support by reaching out to hostile regimes. But Palin’s apparent willingness to uphold Bush’s “freedom agenda” of spreading democracy has not always been received with enthusiasm by Tea Party audiences who embrace small-government. While Tea Party members are, understandably, skeptical of the benefits of “nation building,” neoconservatives such as Frank Gaffney have capitalized on the movement’s nativist leanings by hyping the threat of “creeping Shariah.” Islamophobic fear mongering has proven itself a more effective tool for bringing, otherwise isolationist, Tea Partiers behind the neoconservative’s foreign policy. And besides, a militarist foreign policy is far less expensive—dare I say “more fiscally responsible”?—if the nation building is cut from the budget. Asked at a recent Washington forum whether the new Congress would support or oppose an attack on Iran, Colin Dueck, author of Hard Line: The Republican Party and U.S. Foreign Policy since World War ll, quipped that if you do air strikes you don’t have to do nation building. In this sense, the budget constraints which Tea Party candidates worry about may be much less a barrier to near term neoconservative foreign policy ambitions than might be imagined. Imagine an American president who, during a press conference, extols the importance of cars made by Mercedes Benz or BMW. The reaction, particularly on Fox News, is easily envisioned: outraged cries of “elitist” and “out of touch” would persist for days or even months afterward. Fine. Both Mercedes and BMW manufacture cars in the U.S. But here are two essential points: Those two automakers each control about the same percentage of the domestic car market that automotive analysts believe electric cars will have by 2020. Second, and perhaps more important: the same people who buy Benzes and Beemers – the wealthy – are the ones most likely to buy a new electric car. Obama’s electric vehicle fetish reflects much of the inanity of our discussions about energy. The idea that oil is bad, and that we must therefore throw vast sums of money at efforts aimed at fueling our automotive fleet with something else – anything else – ignores both economic realities and the myriad problems inherent with EVs. Think about those numbers. Out of 300 million Americans, perhaps 1.3 million of them – with many of those living in areas in or around Los Angeles and San Diego — are likely to buy an EV. Hmmm. Three percent of drivers? In both 2009 and 2010, Mercedes and BMW each controlled about 2 percent of the US auto market. Why will EVs be playthings for the rich? The answer is simple: the history of the EV is a century of failure tailgating failure. Consider this quote: In 1911, the New York Times declared that the electric car “has long been recognized as the ideal solution” because it “is cleaner and quieter” and “much more economical” that gasoline-fueled cars. Whenever you hear about the wonders of the new hybrid-electric Chevrolet Volt, which at $41,000 per copy costs as much as a new Mercedes-Benz C350, consider this assessment by a believing reporter: “Prices on electric cars will continue to drop until they are within reach of the average family.” That line appeared in the Washington Post on Halloween, 1915. And since the Volt is being built by GM, ponder this news item which declared that the carmaker has found “a breakthrough in batteries” that “now makes electric cars commercially practical.” The batteries will provide the “100-mile range that General Motors executives believe is necessary to successfully sell electric vehicles to the public.” That story was published in the Washington Post on September 26, 1979. The problem today is the same as it was in 1911, 1915, and 1979: the paltry energy density of batteries. On a gravimetric basis, gasoline has 80 times the energy density of the best lithium-ion batteries. Of course, electric-car supporters will immediately retort that electric motors are about four times more efficient than internal combustion engines. But even with that four-fold advantage in efficiency, gasoline will still have 20 times the energy density of batteries. And that is an essential advantage when it comes to automobiles, where weight, storage space, and of course, range, are critical considerations. Despite the all-electric automobile’s long history of failure, despite the fact that EVs will likely only be driveway jewelry for the wealthy, the Obama administration is providing more than $20 billion in subsidies and tax breaks for the development and production of cars that use electricity instead of oil. Restoring America’s leadership in science and technology is a worthy goal. But by attempting to pick winners in the car business — arguably the world’s single most competitive industry — the Obama administration is forgetting history and the panoply of problems that have kept EVs in the garage since the days of Thomas Edison. It’s time to unplug this subsidy-dependent industry and let the free market work. Why does a billionaire want to take away your Social Security benefits? Peter Peterson is 84 years old. He’s old enough to relax and enjoy the fruits of the years he was well paid for managing other rich people’s money. Why is he spending his fortune to convince politicians they should ruin the average guy’s retirement? Today Peterson announced the next facet in his long campaign to hack Social Security, including a joke Presidential candidate named Hugh Jidette (“huge debt”) and a website called Owe No. His aim is to convince Congress to raise the retirement age, cut Social Security’s cost-of-living increases—and raise the payroll taxes we pay for Social Security and Medicare. It wouldn’t matter what one cranky octogenarian billionaire had to say if he weren’t putting $6 million into ads, funding “expert” commissions, and spreading lies designed to panic the populace. Peterson and pals are the ones George Bush gifted with big tax breaks that are set to expire December 31. Although he says his top priority is reducing the deficit, Peterson doesn’t want to cut that deficit by putting his own taxes back where they were in the 1990s. It’s hard to get your head around how rich Peterson is, and how many rich people there are in this country. But here’s how to put their money in perspective, in relation to Social Security. If Congress decides to extend those tax cuts, for households making $250,000 or more (the top 2 percent of earners), the money the Treasury will lose would be enough to put Social Security in the black for 75 years–and raise benefits by 2 percent. Meanwhile, we have a big chunk of near-retirees today who have barely seen their wages rise at all during their working lifetimes, the last 30 years. They couldn’t save a huge amount; what they saved they had in home equity. And that was wiped away by the financial shenanigans of Peter Peterson and his ilk. There are millions of potential retirees who will have next to nothing except Social Security if they’re ever able to retire. It wasn’t enough for Wall Street to rob us of our houses’ worth and what we had in 401(k)s. Now they want to take Social Security too. Like I said, I don’t understand it. Is there no shuffleboard court where this man could spend his golden years? My mother was an LPN in a nursing home. The last few years that she worked, her back and legs ached so much that she literally had to crawl up the stairs to her bedroom at night. If someone told her that she would have to work three more years before retirement because hedge fund managers don’t want to pay the same percentage of their income towards Social Security as she did, she would tell you what to do. A slew of organizations is organizing a Call-In Day to Congress November 30. That’s the day before President Obama’s deficit commission is set to release its recommendations for raising the retirement age. They’re saying “Owe No You Don’t”—the goal is to create a groundswell of outrage that will make the recommendations dead on arrival. Find out more at strengthensocialsecurity.org and see Labor Notes’ package of fact sheets and info. OCCUPIED JERUSALEM– The Israeli government is “planning to completely destroy the city of Jerusalem and a erect a new Jerusalem with a Zionist vision amid a plan it prepared which it calls the Jerusalem 2020 plan,” Jerusalem attorney Ahmed Al-Ruwaidi said in a statement he released Wednesday. The Jerusalem unit head said the wide-ranging plan envisions new settlements in the city and a complete transformation of Jerusalem’s Old City. The Old City walls will dwindle down to a trace on the full parameters of biblical parks, bridges, and synagogues in an area covering the Silwan, Sheikh Jarah, Wadi Al-Jawz, and Al-Sawanah districts of the city, he added. 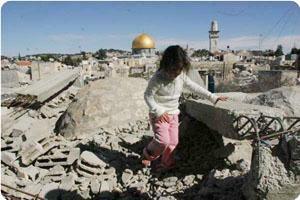 20,000 Palestinian housing units have been threatened with demolition. Under the plan, Arab Jerusalem will make up 71,000 dunums of the eastern and western sides of the city’s total 126,000 dunum land area. Ruwaidi added that planning projects for new settlement units, conferences held in Jerusalem, excavation projects in the holy city’s area, and revocation of Palestinian residencies that have recently appeared in the media are part of a decided Israeli program that the Israeli government and other parties have been working to materialize. Ruwaidi met Wednesday with a legal team from the UK accompanied by political and cultural extensions from the British Consulate in Jerusalem. The delegation is currently developing a report about the situation in the city. The Palestinian attorney presented a comprehensive report to the UK delegation relating to the city and the distress of its citizens, and the need to put the Fourth Geneva Convention of 1949 and The Hague Convention of 1907 into action and to recognize Israel as an occupying force in Jerusalem that has no right to change the city’s landmarks. He called for legal, political, and economic support for Palestinians in the holy city.